This project just started out by reviewing the architectural site plan and floor plan. The necessary orientations were discussed and the important features were outlined, both interior and exterior. Next plan, was to shoot around the weather. The Architects concerns were that the landscaping was not mature and wanted to wait until spring for the final illustrations. Having the snow, eliminated the problems with landscaping and added the contrast of the snow, blue sky and the warmth of the wood, help set a colourful mood. The final exterior at dusk, needed just a little punch, in the vertical columns, supplemental lighting was added. Photoshop has allowed us to add the flag on the flagpole and remove the color cast in the snow from the parking lights. “Ed is truly an artist! 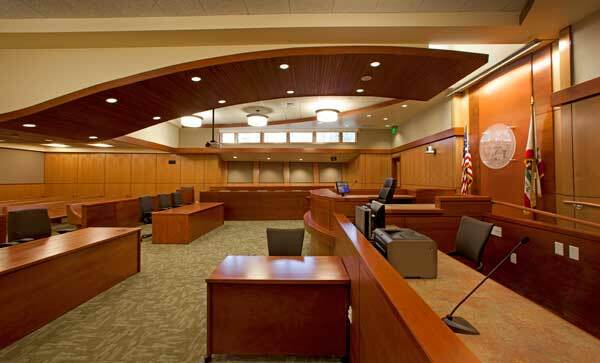 His work at our recently completed Portola Courthouse in Portola, California captures the essence of the project’s design approach. Nestled in a pine grove, the building was designed to reflect its environment. Natural materials of heavy timber wood frame construction juxtaposed against the durability of metal roofing, siding and glass, the building offers a warm and inviting welcome to its users and the community. 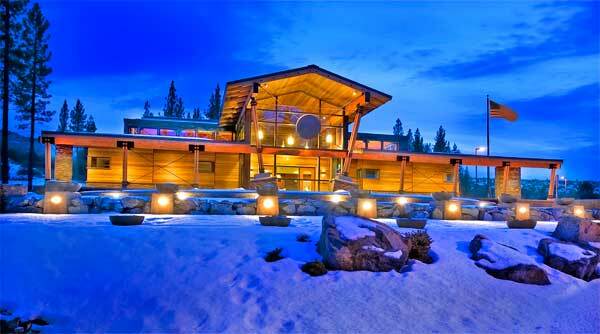 Ed’s artistic use of light and color has brought out the warmth of the wood contrasted by snow that covers the yet to be completed landscaping. He has made this building come alive in his photographs”.